Previously this group reported that a good quality titanium metal powder can be produced from titanium sulfides by electrochemical OS process. 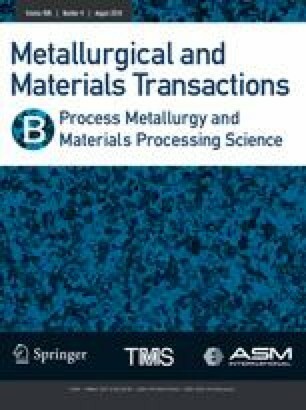 In this study, the sulfurization procedure was examined to synthesize titanium sulfide from titanium oxycarbonitride by CS2 gas. The experiments were carried out in the temperature range of 1173 K to 1523 K (900 °C to 1250 °C) in a tube reactor with continuously flowing argon (Ar) as carrier gas of CS2. The formation of titanium sulfide phases from the commercial TiN, TiC, and TiO powders was studied as the initial step. Then, TiO0.02C0.13N0.85 coming from ilmenite was sulfurized to prepare single phase of titanium sulfide. The products were characterized by X-ray diffraction, and the morphology of the sulfides was rigorously investigated, and the sulfur, oxygen, and carbon contents in the products were analyzed. The process was remarkably dependent on the temperature and time. TiN and TiO0.02C0.13N0.85 powders could be fully converted to the single phase of Ti2.45S4 (Ti2+xS4) at 1473 K (1200 °C) in 3.6 ks. The maximum weight gain of TiN sample was ~ 55.3 pct indicating a full conversion of TiN to Ti2S3 phase. The carbon and oxygen contents in this sulfide prepared from the oxycarbonitride were about 1.8 wt pct C and 1.4 wt pct O, respectively. Therefore, the titanium sulfide could be a promising feedstock for the production of commercial grade titanium powder. Manuscript submitted October 10, 2017. The financial supports from Grant-in-Aid for Scientific Research (B) Number 17H03434, the Center for Engineering Education Development (CEED) of Hokkaido University, Japan Student Services Organization (JASSO) Scholarship and Universiti Sains Malaysia (USM) Fellowship (APEX1002/JHEA/ATSG4001) are gratefully acknowledged. Titanium oxycarbonitride synthesis was made possible by support from USM through the Research University Individual (RUI) Grant (No. 1001/PBAHAN/814273). NIST X-ray Photoelectron Spectroscopy Database, Version 4.1, National Institute of Standards and Technology, Gaithersburg, 2012, http://srdata.nist.gov/xps/.